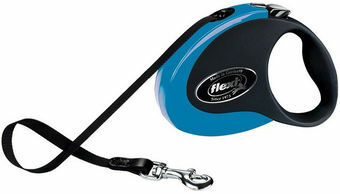 Flexi collection is the classic small dog lead that extends and retracts, allowing your dog to enjoy more freedom of movement, while the owner still remains in control. It Features a reliable braking system, comprising of an easy to use brake button and brake lock, and an automatic retraction mechanism perfect for the smaller pets. These leads also have a soft grip handle with webbing tape, high quality leather trim, chrome plated snap hook all contribute to make this lead a cherished fashion accessory for you pet.